Exhibiting artists: Evan Burnette, Anna Parisi, James Ronner, Kristine Rumman, and Heather Sutherland. The exhibition includes ongoing performances by Kristine Rumman. Working with spices that evoke the smells and memories of childhood in Palestine, observe the artist as she adds to her growing installation of traditional tile patterns on the gallery floor. Performances take place Sunday, February 24 from 12 to 5 PM and Thursday, February 28 from 5 to 7 PM. UrbanGlass presents our biennial exhibition of the best recent MFA work by artists incorporating glass. Chosen from a deep and talented field of graduates from across North America, the exceptional contributions of Evan Burnette, Anna Parisi, James Ronner, Kristine Rumman, and Heather Sutherland stood out, exemplifying both the quality and diversity of aesthetic and conceptual concerns being tackled by artists across the contemporary art spectrum. Hailing from very distinct graduate programs - Burnette from Ball State University, Muncie, ID, 2017; Parisi from Parsons School of Design, New York, NY, 2018; Ronner from Alfred University, Alfred, NY, 2017; Rumman from Tyler School of Art, Temple University, Philadelphia, PA, 2018; and Sutherland from Wisconsin Madison University, Madison, WI, 2017 - these artists have adopted the mixed-media approach to expression common amongst today's conceptual practitioners. Their treatment and usage of glass, however, varies radically across technique and intent. From the immersive installations of Rumman and Ronner to the evocative sculptures of Parisi and Sutherland to the humorous surrealism of Burnette, this work tackles critical issues of race and gender as well as timeless inquiries into the relationship between individuals and the recombinant nature of culture and society. Evan Burnette, born in Springfield, Illinois, received his MFA from Ball State University in 2017. He currently resides in Portland, Oregon, where he is in the process of building a glass studio. Anna Parisi is a Brazilian artist born in 1984 and based in Brooklyn. She earned a BA in communications from Pontifícia Universidade Católica (PUC-RJ) and her MFA in Fine Arts from Parsons School of Design. Anna has exhibited in Westbeth Gallery, Smack Mellon, Artigo Rio, Musée de l'Elysée Lausanne amongst others. Ronner completed a BS in 2005 with a double major in sculpture and molecular biology and a cell and molecular biology MSc in 2006. Ronner has taught at TsingHua University, CAFA Beijing and Alfred University. His work can be seen in both private and public collections in the US, P.R. China and Taiwan. Ronner has received national and international grants from several institutions including the Bernstein Fund, the Joan Mitchell Foundation and the Georges Lurcy Charitable and Educational Trust. In May of 2017, Ronner completed an MFA at Alfred University. Rumman grew up in Toledo, and graduated with a BFA from Bowling Green State University in 2008 and an MFA from Tyler School of Art in 2018. Rumman is a recipient of an award from The Andy Warhol Foundation for the Visual Arts and the Laurie Wagman Prize in Glass. Kristine Rumman is presently based in Philadelphia where she is an Instructor at Tyler School of Art and a new member at Vox Populi. A Virginia native, Heather Sutherland recently graduated from the University of Wisconsin Madison with an MFA in Glass. She has worked with institutions including Chrysler Museum Glass Studio, Tidewater Community College, and Pilchuck Glass School, among others. She has taught summer courses at the University of Wisconsin in Madison and currently teaching fall semester at Salem Community College. Most recently she completed a residency with the Creative Glass Center of America with WheatonArts. Ben Wright holds a BS in Evolutionary Biology from Dartmouth College, a BFA in Glass from the Appalachian Center for Crafts, and an MFA from Rhode Island School of Design. While at Dartmouth, he explored forests from upstate New Hampshire to tropical Jamaica to record and map song birds for the renowned ornithologist Richard Homes. His background in Biology figures strongly in his artwork and curatorial interests, which delve deeply into the ever-evolving relationship between humans and their environment. He has recently curated shows at the Islip Art Museum and the American Museum of Glass. He has taught his unique approach to art making and thinking at numerous schools including Pilchuck Glass School, Penland School of Craft, Ox-Bow School of Art and the University of the Arts in Philadelphia and abroad in Germany, Turkey, Poland, Denmark and Japan and is currently the Director of Education at UrbanGlass in Brooklyn, New York. Graham Caldwell was born in Philadelphia in 1973, and received a BFA in glass from the Rhode Island School of Design, Providence, RI. Selected exhibitions include Martos Gallery in New York; G Fine Art, The Millennium Arts Center, and Addison Ripley Fine Art in Washington DC; Bank in Los Angeles; Circuit 12 in Dallas; Luis de Jesus Seminal Projects in San Diego; and Santa Barbara Contemporary Arts Forum in Santa Barbara, CA. Collections include: Arlington County, VA Public Art Permanent Collection, Arsenal Montreal, ART in Embassies, U.S. Department of State, Permanent Acquisition for US Embassy in Skopje, Macedonia and Kiev, Ukraine. He lives and works in Brooklyn. 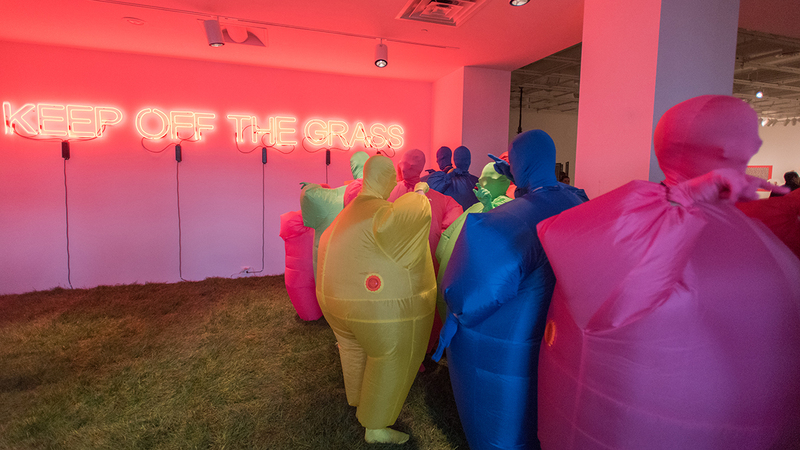 James Ronner, Keep off the grass, 2017. Neon, turf, inflatable found suits, participation, Dimensions variable.